Aarons Outdoor Living has been selling quality backyard structures for many years, so we are more than confident you will love your purchase. But in the unlikely event that you are unhappy with the quality of your purchase, simply let one of our customer service team know within 30 days of purchase and we will endeavour to rectify any issue to your satisfaction. 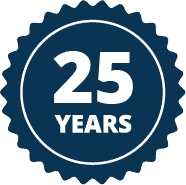 If your purchase is found to have a manufacturing fault during it’s first 12 months, Aarons Outdoor Living will, at their discretion, replace or repair it. However freight costs may be payable by the consumer. Please note that all goods are subject to wear and tear and should be maintained, so our manufacturer’s warranty does not cover conditions caused through general use. Acts of nature including, but not limited to, wind, storms, hail, floods or excessive water exposure. Products that are well maintained will last for many years and will remain safe. For early learning environments, we recommend that you establish a schedule of safety and maintenance inspections so any minor repairs are completed as soon as required. We recommend your inspections are logged as proof that your ‘duty of care’ has been maintained. Check ground surfacing is free of debris and contamination. Check for vandalism and for any damage or missing parts. Isolate if necessary. Sand timbers where splinters occur and if any non-structural cracks constitute any form of entrapment, use an appropriate silicon to fill the crack. Check all fasteners for tightness and tighten as required. To prevent deterioration, remove plastic swings seats and other plastic accessories when not in use for long periods or when temperatures are extreme. Check for evidence of deterioration and if evidence exists, replacements should be purchased. Check all moving parts, oil when necessary. Check wear on self-lubricating bearings and replace if necessary. Check all hardware and equipment for sharp edges and replace as necessary. Check soft fall surfacing to ensure it is at recommended depth and no footings are showing through. Top up if necessary. Ensure any boarders are secure and do not constitute trip points and have no rough/sharp edges. Check synthetic surfaces are in good condition and securely in place to provide impact absorption. Check for any overgrown bushes or hazards that may have intruded into the area. Check the structural integrity of equipment subject to corrosion or rotting and repair as needed. Our warranty applies to the original owner and registrant, and is non-transferable, so proof of purchase must be sighted for a warranty claim to be validated. How to lodge a warranty claim: 1) Contact the store you purchased your product from to explain your concerns. 2) Send a copy of your original sales receipt and a brief written description of the problem, including how it occurred. At Aarons sole discretion, we may ask you to send photographs. We reserve the right to examine photographs or physical evidence claimed to be defective prior to making a final determination concerning the claim. 3) After inspection and consideration, Aarons will make a final determination whether the concern is covered by this warranty. Unless approved for commercial use, under no circumstance should Aarons Outdoor Living products be used in open/public commercial environments unless permitted. Such use may lead to product failure and potential injury and will void this warranty. Modification voids any and all warranties, and Aarons Outdoor Living will accept no liability for any modified products or consequences resulting from failure of a modified product. While natural timber products are extremely sturdy and durable, timber products are organic and can be influenced by its surroundings. This means that temperature changes and moisture levels changes can be cause natural movement, splits and checks in the timber as it shrinks and dries over time. All woods are hygroscopic, that is, it will absorb or discharge moisture to attain equilibrium with the surrounding atmosphere. Typically, in the Australian climate, it is common to experience a loss of moisture. The loss of moisture content from the wood, results in the shrinkage of wood due to the loss of water. This can be interpreted by some that it weakens the overall quality of wood. However, in reality, the opposite occurs. In fact, seasoned timber (dried timber) contains properties that make it superior to wet timber. In fact, the drying of timber results in increased strength, bending strength and stiffness. Also, as the plant cells become more compressed, it results in a structure that is harder and more resistant to bumps and other damage. Lastly, the decreased water content considerable reduces the weight of timber. When our timber is first sourced by the timber yards, it is composed of a considerable amount of water which can range anywhere from 40% to 400% of the log. Timbers are then normally kiln-dried to speed up the drying process before we purchase it to manufacture our products. However, dried timber will still retain a small percentage of moisture and the timber will continue to dry when being built and used. Timber dries from the outside to the centre, which can be a lengthy process that can take up to 6 years (timber species and size dependent) to reach its equilibrium moisture content (EMC). As a result, the wood drying process continues well after being installed in your backyard. The drying process generally results in the shrinkage of wood, as the wood shrinks, warping and checks may begin to form in the exterior of the timber. This is recognised and accounted for by timber framers and engineers as a process which doesn’t compromise the integrity of the wood. You can be assured that we supply the correct diameter and size timber pieces to allow for any eventual timber drying cracks to ensure safety is maintained. 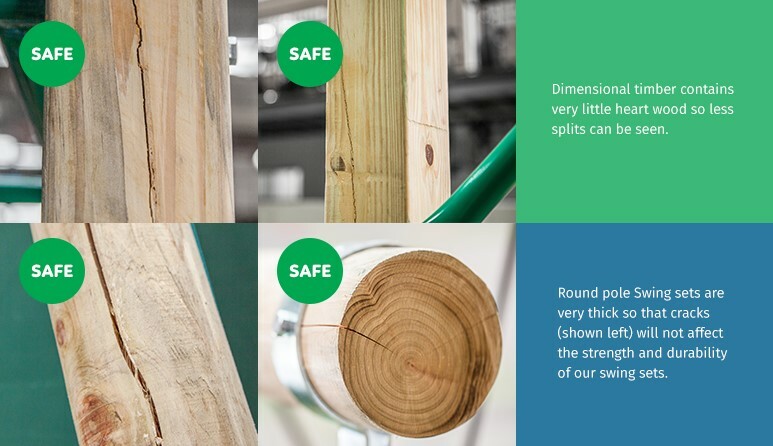 Most of the wood splits will never become large enough to affect the reliability and strength of our products, however, there can be rare cases where splits can occur. Only when a crack develops past the halfway point from the timber, splitting it into two separate pieces, is the structural integrity affected. So you need to maintain your timber products often. Timber must be coated (and re-coated) with an appropriate layer of surface protection such as a stain or paint finish, and how often re-coating is required is again dependent on the product’s surroundings and the look you want maintained – it might be 6 months or 6 years! Be sure to check over your timber products yearly, sand away sharp points or splinters and fill cracks where necessary.